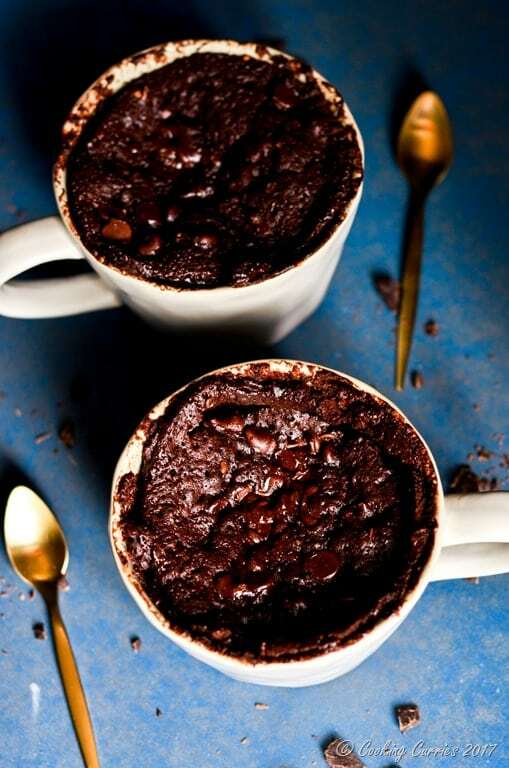 The BEST 2- minute microwave chocolate mug cake you will ever make! There. I said it. 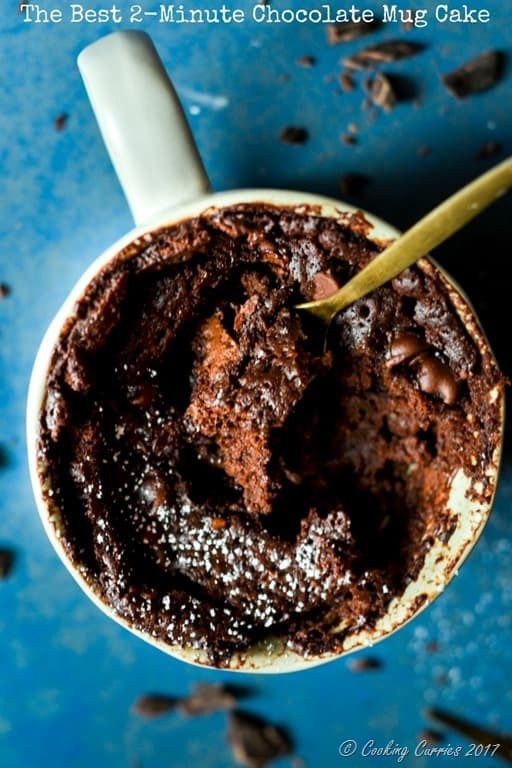 This, guys, is seriously the best chocolate mug cake you will ever make. For years, I have tried following a lot of recipes I have seen out there but nothing was good enough for me. They were always never enough sweet or never enough moist or sometimes even never enough chocolate!! I tried and tried, ever since the microwave mug cake thing started a few years ago. But it just never worked for me. Then I saw this video by Trisha Yearwood for making a chocolate mug cake and that cake looked really moist, atleast in the video. I made it the same day and eventhough it was not as 1moist as I wanted it to be, it was still one of the better ones I had made. 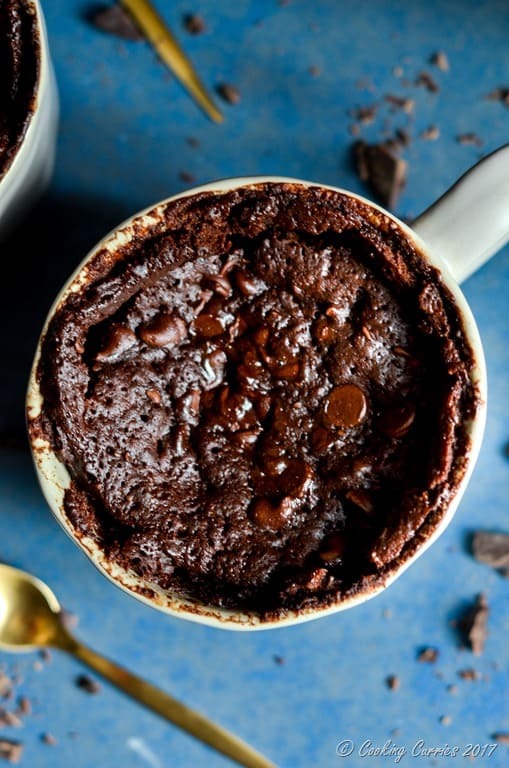 So I took that recipe and have been modifying it for the last one year or so and voila , here is my recipe for an instant chocolate mug cake! And yes, it has lots of chocolate, it is moist, it is sweet, it is everything you want in a chocolate cake!! What are you waiting for? scroll down to the recipe and make it right now. Trust me, you wont regret it! I think the secret to this recipe is half a shot of freshly made hot espresso and chocolate and coffee extracts. It adds some much needed moisture to take care of any dryness in the cake and coffee always elevates the chocolate flavor to make it so much more divine. I always use Nielsen Massey brand of extracts, whether it is Vanilla extract, Coffee extract or Chocolate extract. Not only does this brand have a wide variety of extracts, I find the flavors to be so much more concentrated than other brands. Do you ahve a favorite brand that you use? I would love to know! Add all the ingredients, except for the chocolate chips, in a microwave safe mug, in the order listed. Whisk well, till there are no lumps of flour and sugar. Top with the chocolate chips and microwave for 90 secs. Wait for a few seconds before you dig in. Be very careful as it will be very hot inside and you may not know it. Best when served hot. I Have never made a mug cake and I’m always so fascinated by it. Your pics are drool worthy. Thank you! ? it’s super easy and you have nothing to lose! You should try! Nothing like being able to make a cake in a mug when you want something sweet, but don’t want to go through the efforts to make a cake!! This looks yummy!! Mmmmm…that does look like all kinds of moist and chocolatey goodness! My mug cake is quite moist, but will have to give this a try. Looks too good not to! OMG my wife is having those pregnancy cravings right now where they’re on a whim and I have to run around getting her what she’s craving. I’m going to have to have this recipe on deck next time she’s craving chocolate cake. 2 minutes is right up my alley! Lucky her! To have you to cook for her! Congratulations to the two of you! I love the espresso shot in this super moist and fluffy looking dessert of yours!! Yum! This is a chocolate lover’s dream come true. They can whip up a delicious dessert whenever they want. I will have to send this to my daughter, she will love it. I love, love chocolate cake and this looks quite simple to do. I might try it this weekend. What an absolutely gorgeous recipe! I got rid of my microwave years ago though (I never used it). I wonder if this could be baked in the oven in a tiny single portion dish? HHhrrmmm… ponders! Oh wow! I’ve never made a mug cake before but I love the combo of coffee and chocolate so this must be a winner. You are right!!! That combo automatically makes this a winner! 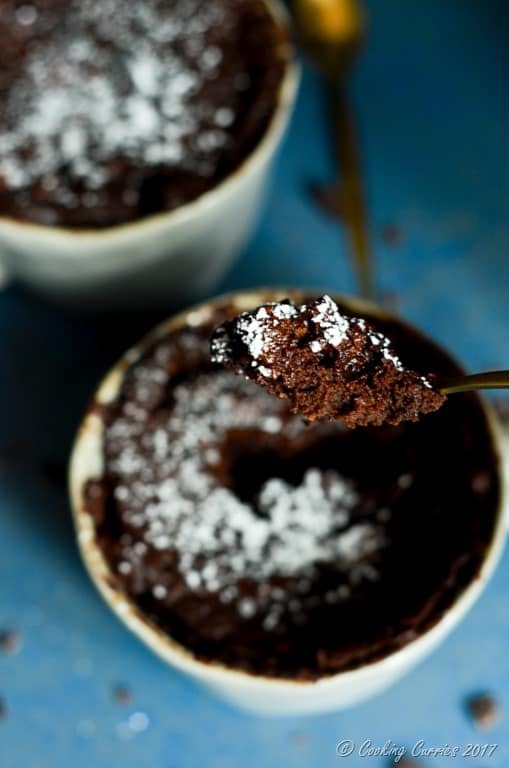 I love mug cakes, they’re perfect for those times when you crave something sweet in a hurry. I like how you’ve added coffee essence and a shot of espresso, gorgeous photos too. I love how quick and easy this is! What a great way to satisfy your sweet tooth! I didn’t want to buy my daughters any candy for Valentines Day, but this quick treat sounds just about perfect. And easy to whip up, too. Thanks for testing out a great idea!